Today we’ll learn “shopping Japanese”. There are tons of interesting things for you to buy in Japan and I hope this lesson will give you enough confidence to try and go shopping alone. Shopping is 買い物 ( = kaimono) in Japanese. 2) 買い物に（へ）行く ( = Kaimono ni (e) iku) to go shopping. = Boku wa kore kara okaimono ni（e) ikimasu. it may sound a bit effeminate. 紳士用 ( = shinshi you) ：用（ = you) means “for” 子供用 ( = kodomo you) for children. Here are other items that you may find in a big store. From Maggie : A very important section!!! In Japan, most of the department stores have a food section on the underground floor. We call it 「デパ地下」( = depa chika) in modern Japanese. デパ（ = depa) is short for デパート ( = depaato) “department store”. 「デパ地下」( = depa chika) refers to the food floor of a department store. Here you’ll find a variety of food — from sweets to delicacies. Note : Clerks are required to call customers as お客さん ( = okyaku san) or お客様 ( = okyaku sama ). 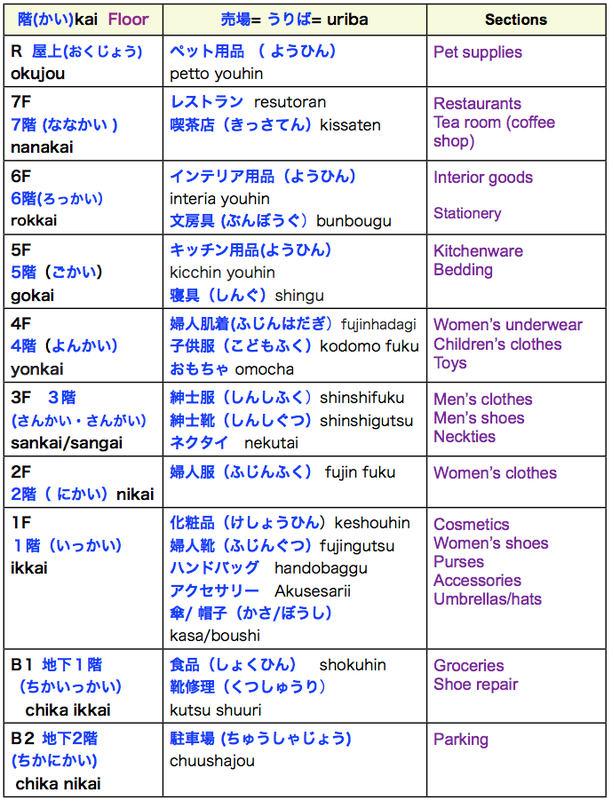 Also if you are a customer, you should refer to shop clerks as 店員さん ( = ten-in san) not just 店員 ( = ten-in). The point being to remember to add さん ( = san). ブティックでの会話 （ = Butikku deno kaiwa) A conversation at a boutique. = Nani ka osagashi desuka? = Ie, miteiru dake desu. = Ie, chotto misete kudasai. = ~ wa arimasu ka? =Motto yasete mieru fuku wo kudasai. = I want (I am looking for) some clothes that makes me look thinner. If you are looking at some clothes, the shop clerk might talk to you. = Sore kawaii desu yone. = Watashi mo onaji no motte irun desu yo. =Kore rasu ichi nan desu yo. = Kagami de awasete mimaska? = Kore oikura desu ka? =Kore saizu wa ikutsu desu ka? Now, you found the clothes you like. Do you want to try it on? =Kagami wa doko desu ka? = Shichakushitsu wa doko desu ka? = Saizu no hou wa Ikaga desu ka? = Maggie looks nice in red. = Maggie doesn’t look good in pink. =Maggie to Max wa oniai da. = They are a good match. Do you wanna different size or color? = Kono kyuugou wa arimasu ka? =Chigau iro wa arimasu ka? = Kore no (Kono) ao arimasu ka? = “I’ll bring it for you.” polite. = Tadaima zaiko ga aruka mite mairimasu. = ~ ga aru ka mite mairimasu. =Sumimasen. Zaiko ga kirette imashita. = Sorry. It was out of stock. =Moushiwake arimasen.Sochira no iro shika gozaimasen. * 在庫が切れる ( = zaiko ga kireru) out of stock. 「申し訳ありません」（ =Moushiwake arimasen) is more polite than 「すみません。」( = sumimasen) . 「申し訳ございません。」(=Moushiwake gozaimasen.) is even more polite. = (Jaa) Kore ni shimasu. They will lead you to 「レジ」( = reji) or「お会計」( = okaikei) the cashier . = Oshiharai (houhou) wa ikaga nasai masu ka? お支払い ( = oshiharai) more polite. = Ikaga nasai masu ka? =Ikkatsu de yoroshikatta desu ka? Note: In Japan there are a couple of ways to pay by credit card. You can choose to pay with one payment or break it up into monthly payments. = Kochira ni goshomei (or sain) onegai itashimasu. 御署名（ = goshomei) more polite. = Kochiraga otsuri ni narimasu. →Grammatically not corrrect but they say that. = Kochira ga ohikae ni narimasu. = Here is your copy/ receipt. Usually in Japan they wrap things very nicely without asking. They ask you if it is for a gift so that they can even more nicely. = Okuri mono you desu ka? = Gojitaku you desu ka? = Is it for yourself? * 自宅 ( = jitaku) one’s own house. ->yourself. = Hai, okuri mono desu. = Ie, jitaku you desu. = Oshirushi wa dou saremasuka? = “Would like to put shirushi (a special paper to indicate a certain occasions )” ? • 御祝い ( = Oiwai) To congratulate some happy occasions. (• 御入学祝い ( = Gonyuugaku iwai)　To congratulate someone who has entered a school. 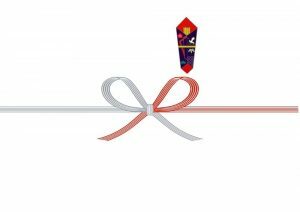 • 御卒業祝い( = Gosotsugyou iwai ) to congratulate someone’s graduation. = As a summer gift,please. = Buta no hikiniku nihyaku guramu kudasai. If the store is very casual such as a fish market, food stools, grocery store, etc, not much formality so they don’t talk to you with excessive formality. 試食コーナー ( = shishoku koonaa) “A sampling corner” is always very popular. You don’t need too talk much at a convenience store. It will be enough if you understand a couple phrases. = Okimari no kata kara douzo! = Fukuro ni oire shimasu ka? =Supuun wa otsuke shimasu ka? Konnichiwa from Kanagawa! Your website has been tremendously helpful as a Japanese language learner and much more practical than textbooks! One question on shopping etiquette in Japan: are you supposed to say anything (other than thank you) when cashiers hand your change/receipt back? normally in department stores you probably don’t see that people use any special words of thankfulness and gratitude, and I would stick to it. A simple どうも is good enough. Observe the people and do like they do. What do people do or how do they react, when a sweet Japanese girl greets them with a いらっしゃいませ♪ ? Well, they do nothing, they imply just ignore </3. There are different customs in different countries, you know. Thank you ＠天人さん for helping everybody while I was gone. Sarah, as 天人 said, many people don’t usually say anything when they receive their change/receipt back. Some nod lightly or greet with their eyes with a subtle smile. If they wrap something nicely or help you a lot, then you say ありがとう. Hi Maggie sensei! I was wondering, when a shop clerk compliments you, what should you say back? You can say ありがとう but in some occasion, ありがとう may sound like you are aware of your beauty. So, how about just saying そうですか？or tell them how much you like the outfits (if you like them). いいですね。/ 色がいいですね。/ かわいいですね。/ デザインがいいですね。or デザインが気に入りました。etc. When you are in the fitting room and the shop clerk ask you “如何ですか？” what do you usually respond ? = Hai, ii mitai desu. = It seems to be OK./ It fits OK.
Hi Maggie sensei, thanks very much, these are very useful! I have a question, I went shopping for clothes today and when I went into the fitting room, the 店員さん asked me something which I later figured should be asking me if I wanted to try on the clothes. However I did not catch what she said, would you be able to share what does the 店員さん usually say when we enter the fitting room and how we can respond to that? Thanks! Hmm it is hard to guess what they said but let me try. If you went to the big store where there are a lot of fitting rooms, they talked to you to check how many items you have. = Kochira no itten de yoroshikatta desuka? = So you have one item, right? →You can just say はい and if you have more items, you say あとこれも試着したいです。= Ato kore mo shichaku shitaidesu. = M saizu de yoroshikatta desuka? = This is size M, is that all right? Again if so, you can say はい(=hai) if not, you can ask them ~~~サイズをお願いします。= ~~~ saizu wo onegai shimasu. = Goshichaku owarimashitara ichido dete misete itadakemasu ka? = Could you come out once when you try it on? = Saizu no hou wa ikaga desuka? = Does it fit you? / How’s the size? Wow, thanks for the very detailed reply! That really helps a lot! I thought I might have heard something ～おしゃれって…, is that an honorific form? If they say the word おしゃれ. It is not an honorific expression but it means “fashionable”. i see, thanks for the explanation! Thank you so much for the lessons. Could you explain the sentence お決まりの方からどうぞ? We use お決まり at the restaurant or fast food as well. = Gochuumon wa okimari desu ka? = Do you know what to order? Ohayo Maggie Sensie, Your lesson is very helpful. Domo arigato gozaimasu. Do you have a lesson specifically at a grocery store when you pay at the cashier. They say or ask you so many things once you paid. For example, my bill was 526 yen so I gave them 1,026 yen so I get a full 500 yen back. They said or asked something and i could not understand. They also ask me so many things before they give me plastic bags, is it possible for you to please give me a list of what they actually say versus the questuons they actually want answers..? I don’t have a particular lesson for grocery store. = ~ en oazukari itahsimasu. My bill was 526 yen so I gave them 1,026 yen so I get a full 500 yen back. They said or asked something and i could not understand. Probably they were just saying how much they have received and how much change they give you. This is a typical pattern. = ~~~ en oazukari itashimashita node ~ en no okaeshi ni narimasu. = Since we have received ~~ yen from you, I will give you ~ yen change. = Sen nijuurokuen oazukari itashimashita node gohyakuen no okaeshi ni narimasu. = Since we have received 1026 yen from you, I will give you back 5,00 yen change. = Ichimanen kara de yoroshikatta deshouka? = From 10,000 yen, right? = Komakai hou yoroshikatta deshouka? = Would like to pay small change? About a plastic bag, レジ袋= reji bukuro many places charge for a plastic bag now so they ask you if you have your own bag or you need a plastic bag. Ex. 袋は必要ですか？= Fukuro wa hitsuyou desuka? Ex.袋はお持ちですか？ = Fukuro wa omochi desuka? Ex.袋は御入用ですか？ = Fukuro wa goiriyou desuka? Ex.袋はご利用でしょうか？ = Fukuro wa goriyou desuka? If I think of any other expressions, I will keep adding them here. Maggiesensei, these questions attacked me while reading this lesson. No, thank you. Do you mind if I just look around. 1) a) Wouldn’t this sentence be used to ask the store clerk to show you some stuff to buy? Or to let you see the store? b) I may be confusing the meaning of the words “miseru” and “misaseru” though. :/ Sensei, could you tell me the difference between these two words? Or am I completely off, sensei? lol What I am not sure is if what is made to fit in this sentence is the “piece of clothing” in question. 3) Is mairimasu used as a polite form of kuru, as in “mite kuru”? This dress makes me look fat. Can gozaimasu be used as a substitute for “imasu” as well? I have listened to the expression of “de gozaimasu” while a person addresses himself in an anime. Do I read this as “gonyuugaku iwai” or “onyuugaku iwai”? Thank you sensei for your time and as always, no rush. Whenever sensei has the time. The direct translation is : Will you show me / May I see / Let me see (what you have in this store). You can use this phrase to ask someone to show something or someplace. Since you are asking a shop clerk to show you what they have, you can use this phrase. And yes, you can use this phrase to ask a shop clerk to show you something. = Excuse me. May I see this hat, please? / Could you show me this hat please? = May I see / Could you show me the blue sweater in the store window please? 見させる= could be two things and that is why it is confusing. 1) When it is uses as a causative verb = to make someone see something. Ex. Aにsomethingを見させた。= I made A see seomething. 鏡で合わせる is an idiom. You put on the clothes or simply holding the clothes as if you wear them in front of the mirror and see if you like the design, size or color would fit you. 4) Ahh, you are right! Thank you for spotting the mistake. I will fix it. Right ございます can be used to address yourself. Very polite. マギーでございます！= I am Maggie. I think I got it now. In “misete” someone will show you something while in “misasete” someone will make you or let you see. What was kind of confusing is that the end result is similar, by the action of someone I see, being it either by being shown or made/allowed to see. I think you got it but just in case I will type out the basic forms below. The both mean the same thing. Please let me see something/Show something to me. But b) sounds a bit more humble and polite. Sensei, seems like one of the things that got me confused is that “miseru” is not an inflection of “miru”, in other words: “miru” =/= “miseru”. “Miseru” is a verb on its own, right? Sensei, with the first explanation it was clearer than water, with the second explanation it is clearer than air. XD Thank you Maggiesensei. But you are right. It is easier to think they are different words at the moment. Good that my explanation cleared things up. Oh is that so? The plot thickens. lol I’ll follow your advice sensei. Edit: I couldn’t find the reply option to sensei’s last comment, I meant to reply to sensei’s last comment just in case. how to say..i’m sorry,i don’t have a small change..
or sorry i don’t have enough small change to give..
maggie sensei..what does nakute mean..
i have been in nihon for a month..so i always get stuck at cashier counter when buying something.. :)..but u really help me a lot..
We often don’t finish the sentence and let the listener figure out the rest. = Gomennasai (or Sumimasen.) Kozeni wo motte imasen. or Kozeni ga arimasen. thanks for that phrase..that is what i’m looking for..sorry coz i am a new learner..hiii..
どういたしまして！= Dou itashimashite = You’re very welcome! 電化製品 hey I recognize the first kanji! it’s from densha=train? and they really tell u it looks good on you and ask if the size and color is ok?? heheh yasashi yo^^ here they usually don’t make any comments and u usually have to go find them yourself and call out to them and then ask them…. m(__)m) what’s included in 日常品 ?? I’ve never heard of such a section before! 日常品 is also called 日用品 = nichiyouhin and it includes all kinds of articles for everyday such as detergent, dish soap, toilet paper, kitchen paper, clothes hangers, etc.etc. Oh, I bet you will LOVE shopping in Japan!! sensei I also heard of this word “pittari” so is that the same as 似合う? ぴったりis usually used when something is just the right size or something fits perfectly. But you can also say when it looks good on you as well. Also you can use ぴったり for people or intangible things as well. Ex. 私にぴったりの人を見つけた。= I found a right (perfect) person for me. Ex. 息がぴっったり= iki ga pittari = to have a perfect harmony, etc. me again! i just wanna to say im enjoying studying/reading your lessons! i am literally writing them down on my notes! Thank you for your comment! Hope you can use this lesson when you go shopping! Aha! That makes a lot of sense. Thanks! I always learn a lot from these lessons. This was a great lesson! Thanks for all your hard work, I really appreciate it. Please excuse my ignorance, I’m just beginning with Japanese and I can’t read kanji yet. I have a small question; When one says “Tadaima omochi itashimasu” is this the same “tadaima” that one would say upon returning home? Do they have the same literal meaning? Tadaima “只今” means “(right) now”. When we come back home, we say “Tadaima” to our family that means “只今、帰りました。”(Tadaima kaerimashita.) 帰る(=to return)-> I just came back home “now”. 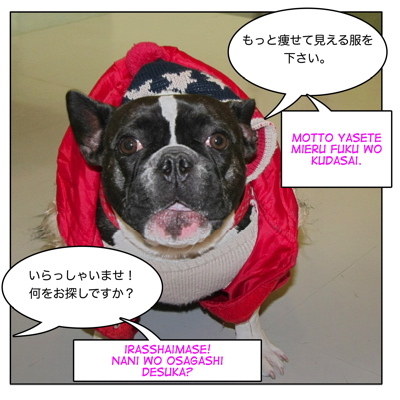 A lot of Japanese say just the first part (=tadaima) without saying ( “kaerimashita.”). So it is the same meaning of “只今、お持ちします。”(=Tadaima omochi shimashita. )-> I will bring it to you right now. I’m very happy to hear it is useful. It ended up a long lesson but hope all my friends with different levels + purposes of learning Japanese can use my blog to study. Depaato ni mo 本売場 arimasuyo. 書籍売場（=shoseki uriba) tomo iimasu. Watashi no sukina uriba wa 「お肉売場」”oniku uriba” (=meat section) to 「ペット用品」”petto youhin uriba” desu.